Directive 2010/30/EU requires the Commission to adopt delegated acts as regards the labelling of energy-related products that have a significant potential for energy savings and a wide disparity in the relevant performance levels with equivalent functionality. Local space heaters with equivalent functionality exhibit a wide disparity in terms of energy efficiency and the energy they use accounts for a significant share of the total energy demand in the Union. The scope for reducing their energy consumption is significant. Local space heaters using non-woody biomass have specific technical characteristics and should therefore be exempted from this Regulation. Harmonised provisions on labelling and standard product information should be laid down in order to provide incentives for manufacturers to improve the energy efficiency of local space heaters, to encourage end-users to purchase energy-efficient products and to contribute to the functioning of the internal market. 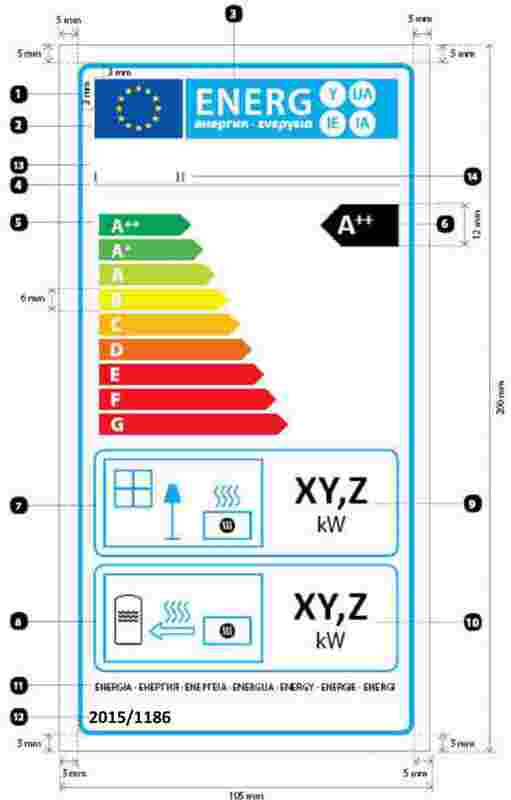 As the typical use and therefore also energy consumption of local space heaters is different to that of other space heating products being regulated, this Regulation should introduce a labelling scale different to that of other space heating products. As luminous and tube local space heaters are products directly purchased by professionals and not by final consumers no energy labelling requirements relating to them are set in this Regulation. The minimum requirements applying to electric local space heaters under Commission Regulation (EU) 2015/1188 (2) provide the maximum technical improvement potential of these products. In consequence, no room for differentiation will be left among them. Electric local space heaters cannot be directly substituted by more efficient local space heaters using other fuels and in consequence, the label would not achieve the objective of providing information to consumers about the relative efficiency of different products. Promoting the use of renewable energy in heating products is consistent with the objective of promoting renewable energy. It is therefore appropriate that this Regulation introduces a specific approach for local space heaters, a ‘biomass label factor’ set at such a level that class A++ can be reached by solid fuel local space heaters using pellets only. The information provided on the label should be obtained through reliable, accurate and reproducible measurement and calculation procedures which take into account recognised state-of-the-art measurement and calculation methods including, where available, harmonised standards adopted by the European standardisation organisations, in accordance with the procedures laid down in Regulation (EU) No 1025/2012 of the European Parliament and of the Council (3), for the purpose of establishing ecodesign requirements. This Regulation should specify a uniform design and content for the product labels of local space heaters. In addition, this Regulation should specify requirements for the product fiche and technical documentation for local space heaters. Moreover, this Regulation should specify requirements in respect of the information to be provided in any case of any form of distance selling of local space heaters and in any advertisements and technical promotional material for such local space heaters. This Regulation establishes requirements for the energy labelling of, and the provision of supplementary product information on local space heaters with a nominal heat output of 50 kW or less. ‘indirect heating functionality’ means the product is capable of transferring part of the total heat output to a heat transfer fluid, for use as space heating or domestic hot water generation. ‘equivalent model’ means a model placed on the market with the same technical parameters set out in Table 2 or Table 3 of Annex V as another model placed on the market by the same supplier. any technical promotional material concerning a specific such local space heater model and describing its specific technical parameters includes a reference to the energy efficiency class for that model. any technical promotional material concerning a specific local space heater model which describes its specific technical parameters includes a reference to the energy efficiency class of that model. The information to be provided pursuant to Articles 3 and 4 shall be obtained by reliable, accurate and reproducible measurement and calculation methods which take into account the recognised state-of-the-art measurement and calculation methods, set out in Annex VIII. Member States shall apply the procedure laid down in Annex IX when assessing the conformity of the declared energy efficiency class of local space heaters. The Commission shall review this Regulation in the light of technological progress no later than 1 January 2024. The review shall in particular assess whether the exemptions from application of the Regulation can be reduced. 2. It shall apply from 1 January 2018 for local space heaters that are not flueless heaters using solid fuels or open to chimney heaters using solid fuels. However, Article 3(1)(f) and (g) and Article 4(b), (c) and (d) shall apply from 1 April 2018. 3. It shall apply from 1 January 2022 for flueless heaters using solid fuels and open to chimney heaters using solid fuels. However, Articles 3(2)(f) and (g) and Article 4(b), (c) and (d) shall apply from 1 April 2022. Done at Brussels, 24 April 2015. (2) Commission Regulation (EU) 2015/1188 of 28 April 2015 implementing Directive 2009/125/EC of the European Parliament and of the Council with regard to ecodesign requirements for local space heaters (see page 76 of this Official Journal). (3) Regulation (EU) No 1025/2012 of the European Parliament and of the Council of 25 October 2012 on European standardisation, amending Council Directives 89/686/EEC and 93/15/EEC and Directives 94/9/EC, 94/25/EC, 95/16/EC, 97/23/EC, 98/34/EC, 2004/22/EC, 2007/23/EC, 2009/23/EC and 2009/105/EC of the European Parliament and of the Council and repealing Council Decision 87/95/EEC and Decision No 1673/2006/EC of the European Parliament and of the Council (OJ L 316, 14.11.2012, p. 12). ‘moisture content’ means the mass of water in the fuel in relation to the total mass of the fuel as used in the local space heater. (1) Directive 2012/27/EU of the European Parliament and of the Council of 25 October 2012 on energy efficiency, amending Directives 2009/125/EC and 2010/30/EU and repealing Directives 2004/8/EC and 2006/32/EC (OJ L 315, 14.11.2012, p. 1). The energy efficiency class of a local space heater shall be determined on the basis of its energy efficiency index as set out in Table 1. The energy efficiency index of a local space heater shall be calculated in accordance with Annex VIII. for local space heaters with heat transfer to a fluid, the indirect heat output in kW, rounded to the nearest one decimal place. The design aspects of the label for local space heaters shall be in accordance with point 2 of this Annex. Text: Calibri regular 8 pt, 100 % black. The supplier's name or trade mark and model identifier shall fit in a space of 86 × 12 mm. any specific precautions that shall be taken when the local space heater is assembled, installed or maintained. One fiche may cover a number of local space heater models supplied by the same supplier. a list of equivalent models, if applicable. This information may be merged with the technical documentation provided in accordance with measures under Directive 2009/125/EC of the European Parliament and of the Council (1). (1) Directive 2009/125/EC of the European Parliament and of the Council of 21 October 2009 establishing a framework for the setting of ecodesign requirements for energy-related products (OJ L 285, 31.10.2009, p. 10). the indirect heat output in kW, rounded to the nearest one decimal place. The size and font in which the information referred in point 1 is printed or shown shall be legible. ‘alternative text’ means text provided as an alternative to a graphic allowing information to be presented in non-graphical form where display devices cannot render the graphic or as an aid to accessibility such as input to voice synthesis applications. The appropriate label made available by suppliers in accordance with Article 3(1)(b) or Article 3(2)(b) shall be shown on the display mechanism in proximity to the price of the product. The size shall be such that the label is clearly visible and legible and shall be proportionate to the size specified in point 2 of Annex III. The label may be displayed using a nested display, in which case the image used for accessing the label shall comply with the specifications laid down in point 3 of this Annex. If nested display is applied, the label shall appear on the first mouse click, mouse roll-over or tactile screen expansion on the image. 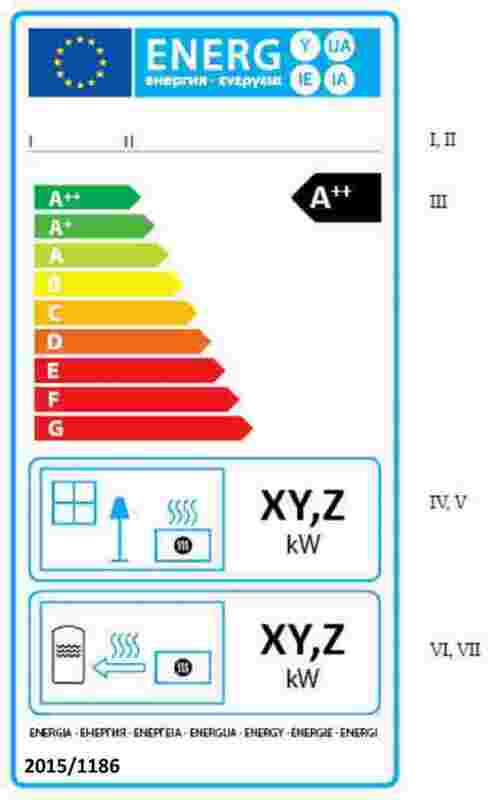 the alternative text for the graphic, to be displayed on failure to display the label, shall be the energy efficiency class of the product in a font size equivalent to that of the price. The appropriate product fiche made available by suppliers in accordance with Article 3(1)(d) or Article 3(2)(d) shall be shown on the display mechanism in proximity to the price of the product. The size shall be such that the product fiche is clearly visible and legible. The product fiche may be displayed using a nested display, in which case the link used for accessing the fiche shall clearly and legibly indicate ‘Product fiche’. If nested display is used, the product fiche shall appear on the first mouse click, mouse roll-over or tactile screen expansion on the link. For the purposes of compliance and verification of compliance with the requirements of this Regulation, measurements and calculations shall be made using harmonised standards the reference numbers of which have been published for this purpose in the Official Journal of the European Union, or using other reliable, accurate and reproducible methods that take into account the generally recognised state-of-the-art methods. They shall meet the conditions set out in points 2 to 4. Local space heaters shall be tested for the preferred fuel in order to determine the energy efficiency index, direct and indirect heat output. Declared values for direct and indirect heat output, and energy efficiency index, shall be rounded to the nearest one decimal place. The useful efficiency values ηth,nom , ηth,min and the direct and indirect heat output values for Pnom , Pmin are measured, where applicable. The energy efficiency index (EEI) shall be calculated as the seasonal space heating energy efficiency in active mode (ηS,on ) corrected for local space heaters using biomass as preferred fuel by a factor taking into account the renewable character of the preferred fuel, and corrected by contributions accounting for temperature controls, auxiliary electricity consumption and permanent pilot flame energy consumption. The energy efficiency index (EEI) is expressed as a figure equivalent to its figure expressed in percentage. F(5) is a correction factor accounting for a negative contribution to the energy efficiency index by energy consumption of a permanent pilot flame, expressed in %. ηth,nom is the useful efficiency at nominal heat output, based on NCV. For all local space heaters the correction factor F(2) is equal to one of the factors according to Table 4, depending on which control characteristic applies. Only one value can be selected. From 1 January 2022, F(2) shall be zero for solid fuel local space heaters with emissions, where the temperature control is set at the minimum heat output, higher than those set out in Annex II, point 2 of Commission Regulation (EU) 2015/1185 (1). The heat output in this setting must not be higher than 50 % of the nominal heat output. From 1 January 2022, if F(2) is not zero the technical documentation shall include the relevant information on emissions at minimum heat output. For all local space heaters the correction factor F(3) is the summation of the values according to Table 5, depending on which control characteristic(s) applies. From 1 January 2022, F(3) shall be zero for solid fuel local space heaters with emissions, where the temperature control is set at the minimum heat output, higher than those set out in Annex II, point 2 of Regulation (EU) 2015/1185. The heat output in this setting must not be higher than 50 % of the nominal heat output. From 1 January 2022, if F(3) is not zero the technical documentation shall include the relevant information on emissions at minimum heat output. This correction factor takes into account the auxiliary electricity consumption during on-mode and standby-mode operation. Pnom is the nominal heat output of the product, expressed in kW. This correction factor takes into account the permanent pilot flame power requirement. (1) Commission Regulation (EU) 2015/1185 of 24 April 2015 implementing Directive 2009/125/EC of the European Parliament and of the Council with regard to ecodesign requirements for solid fuel local space heaters (see page 1 of this Official Journal). The Member State authorities shall test one single unit per model. The unit shall be tested with a fuel with characteristics in the same range as the fuel that was used by the manufacturer to perform measurements according to Annex VIII. for gaseous fuel local space heaters, the EEI is not more than 8 % lower than the declared value. If the result referred to in point 2(a) is not achieved, the model and all equivalent models shall be considered not to comply with this Regulation. If any of the results referred to in points from 2(b) to 2(d) is not achieved, the Member State authorities shall randomly select three additional units of the same model for testing. As alternative, the three additional units selected may be of one or more equivalent models which have been listed as equivalent products in the supplier's technical documentation. for gaseous fuel local space heaters, the average EEI of the three additional units is not more than 8 % lower than the declared value. If the results referred to in point 2 are not achieved, the model and all equivalent models shall be considered not to comply with this Regulation. The Member State authorities shall provide the test results and other relevant information to the authorities of the other Member States and to the Commission within one month of taking the decision on non-compliance of the model. Member State authorities shall use the measurement and calculation methods set out in Annex VIII.